Hydraulics usually power giant machines, from bulldozers to airplanes. But can they power a bicycle? That's the idea behind the NFPA Fluid Power Vehicle Challenge, a national contest where students build a chainless bicycle, powered solely by hydraulic pumps and motors. 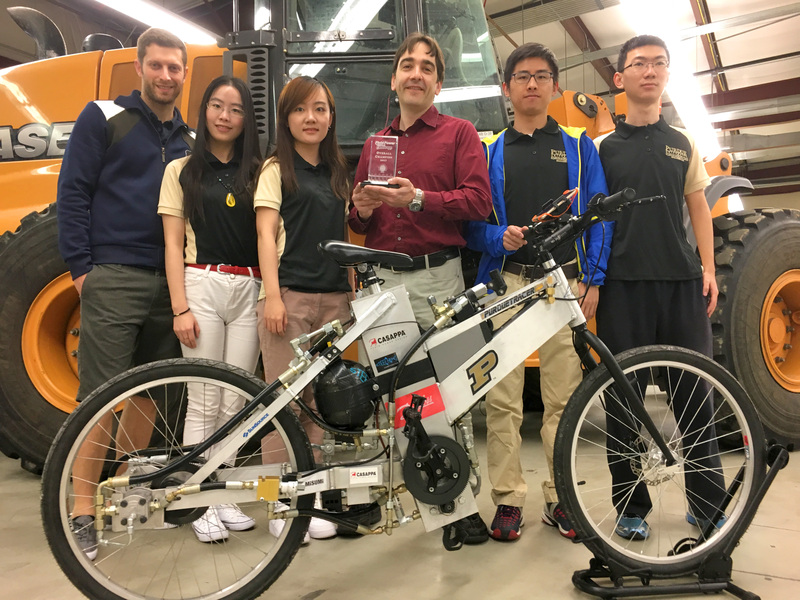 In April, Purdue University won the 2017 competition, with students designing a custom bike frame that doubles as the hydraulic oil reservoir, and a smartphone app to monitor telemetry. "The idea behind the competition is to use fluid power technology in new ways," said Andrea Vacca, associate professor of both Mechanical Engineering and Agricultural and Biological Engineering, which joined forces on the project. "It's a real challenge, because a bicycle is small and light-duty. Most teams take an existing bicycle and modify it, but this year our team started from scratch." Students designed and built a custom two-wheeled bicycle frame out of aluminum, balancing the needs of the hydraulic systems with the feel of a "normal" bicycle. "It's very easy to ride," said Gianluca Marinaro, who rode the bicycle for the competition. "When you pedal, you generate hydraulic flow, which allows the motors to drive the rear wheel. And we built the hydraulic reservoir into the frame of the bicycle, so it has the same balance as a normal bike." Marinaro built most of the frame, with help from lab manager Anthony Franklin. 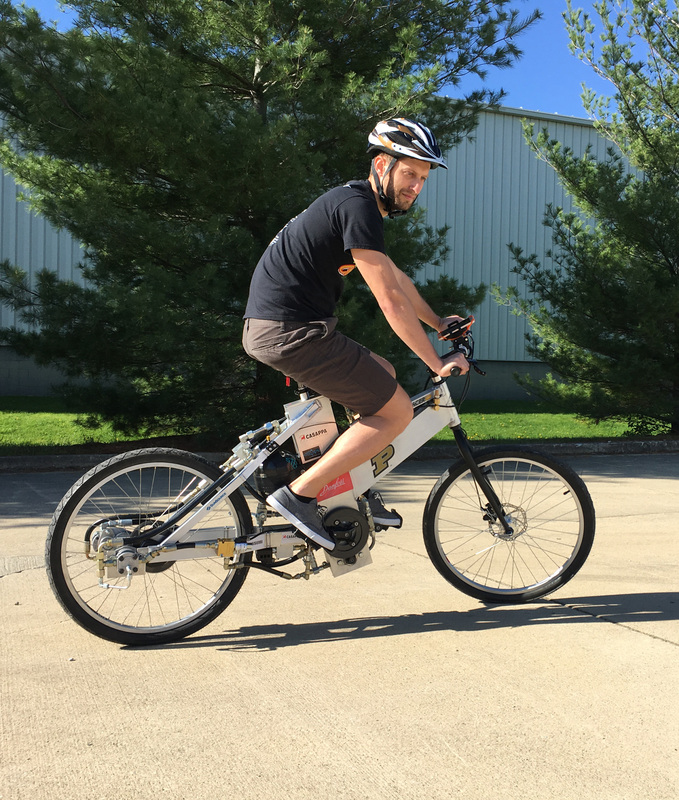 The finished bicycle, nicknamed "Purdue Tracer," has some other tricks up its sleeve. Team member Zhuangying Xu developed an accompanying smartphone app. "It's completely integrated with the bicycle," said Xu. "You can see how much pressure is in the hydraulic lines, how fast you're pedaling, and even your heart rate. We've also integrated things like weather and geolocation, so it is a very intelligent bicycle." Another feature is the accumulator, which featured prominently in the 2017 competition. "One of the contests was to power the bike without pedaling," said Vacca. "With our hydraulic system, we could attach a lever and hand-pump the accumulator beforehand, which gave us about 500 meters of travel without pedaling." Vacca's students had entered similar contests for the past six years, but this is the first time they've come out on top. "It's not so much about the bicycle as it is about using fluid power in unique ways," said Vacca. "We're very lucky at Purdue to have the Maha Fluid Power Research Center, which is the largest academic hydraulics lab in the country. Our students have the ability to tackle any problem, big or small." For the students, victory was sweet, but not as sweet as the accomplishment of building the bike itself. "What I enjoy most is the teamwork," said Xu. "Our team spirit is very good. We are the perfect mix of electrical, mechanical, and hydraulic students. We've really enjoyed this process."